There is a PACT (Police and Community working Together) at 6pm, at Swanage Town Hall tomorrow, Tuesday 29th November. I don't know the full scope of the agenda, but gather that the problems of violence, noise and anti-social behaviour in the High Street is on the agenda. Meeting is open to the public. 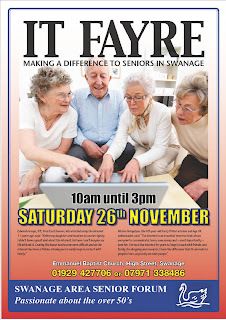 Swanage Area Senior Forum is going out on a seasonal limb for our December gathering. 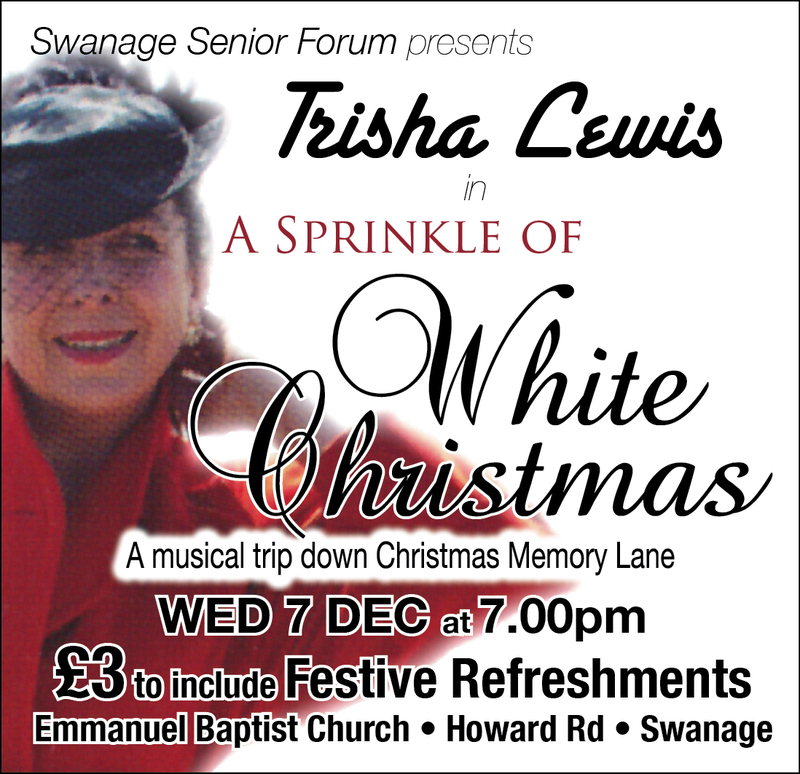 We are proud to present the amazing entertainer Trisha Lewis in 'A Sprinkle of White Christmas', a sparkling trip down memory lane. For just £3, which includes festive refreshments, you can listen, laugh and sing-a-long with Trisha. She has been described as giving a 'spellbinding performance' (Bath Chronicle), 'enthralling' (Lancashire Evening Post) and 'an actress who equally makes us laugh or cry' (Western Gazette). 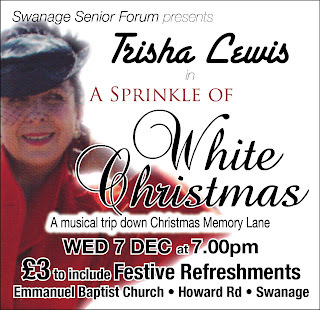 If you haven't seen or heard Trisha Lewis perform, then you are in for a very special treat, so don't miss out on this chance to kick off the festive season and join Swanage Senior Forum members in a heartwarming evening's entertainment. Everyone is welcome – whatever your age ! We will also be having a Christmas raffle with lovely prizes, which will be drawn as you munch on mince pies and enjoy mulled wine. So – make a date to join us and put this event in your diary NOW: Wednesday 7th December, 7 til 9pm, Emmanuel Church, Howard Road, Swanage. For transportation or further information 07971 338486. EDucation Swanage has produced a newsletter, detailing progress. You can download from link above. There are still 5.7 million people over 65 who have never accessed the internet. Many fear computers and think the skills needed are beyond them. Most have no idea of how vast and fascinating are the things that can be done. Many are not aware of the special facilities for those with difficulties in sight, hearing or control. 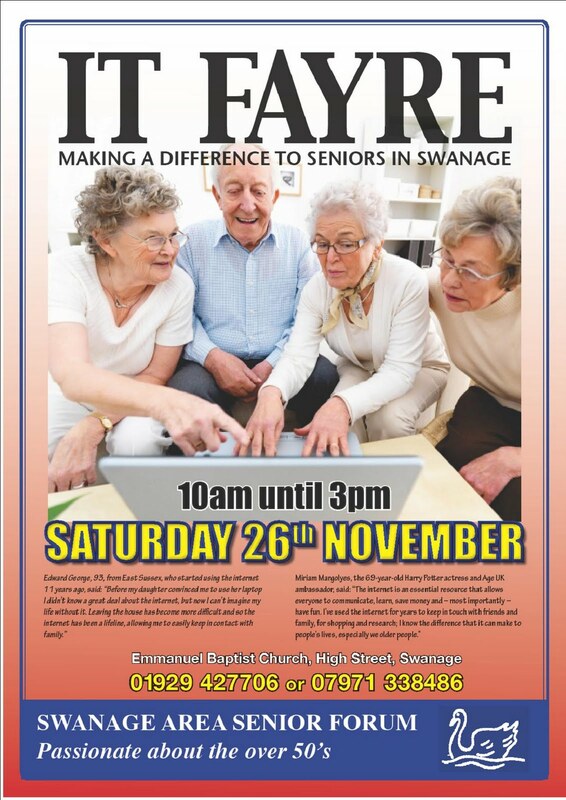 We are holding an IT Fayre in Swanage where you will be able to meet other seniors like you and see what they are doing. Technology is so important and can offer older people numerous benefits, such as keeping in contact with loved ones more easily, capturing important moments in life, shopping without leaving home and so much more. Free transport is available, including disabled access and refreshments on the day. If you are already using the internet and computer technology why not spread the word and tell your non-IT friends what we are doing ! We have booked Lady St Marys Parish Hall on the Quay at Wareham for Sat 17th Dec 2011 between 4-7pm. We wish to provide a Xmas Party for disabled children any age welcome. We will have a party Tea with entertainment from a young musician, Christmas carols, children’s Xmas DVD etc we will go with the flow. Parents/carers are necessary for the well being of their own children. Please contact below should you wish your child to attend. It would be great to see them. Should you not be available you may well know somebody who is then please pass on my details. Congratulations to the Mowlem on the wonderful article in the Echo! Swanage's Purbeck Deli has won gold in the prestigious Taste of the West Awards. The deli is one of only four Dorset retail businesses to receive the top award, and is the only delicatessen to make the exclusive list. I think the time has come to review the scope of what can be said on this site. Some recent comments have made serious accusations about individuals or businesses, which must at least be upsetting, and at worse could affect business. Although it may be a shame to limit the possible value of this site by restricting what can be said, it seems only proper that no comments/posts should be made that could be considered libellous. While it can be difficult to prove libel, and to act against those who make such comments, especially if made anonymously, it's only fair to err on the side of caution. In future, please avoid making any comments that are defamatory, malicious or untrue, whether about individuals or businesses. I'll add racist to that list, too. If you wish to make a comment that might stray into this area, please phrase it in such a way that does not make specific allegations against identifiable individuals or businesses. In future, any comments that are, or may be, potentially libellous will be deleted. Coastview has been launched on iCoast – take a look at http://goo.gl/4JadF Coast view is similar in concept to Street View in Google Maps. You can explore the Dorset coast with sea-level photographs taken from a boat rather than street-level imagery taken from a car. Coast view gives you remarkable views of the cliffs and coast so that it is easier to see what access is like to beaches along the coast for kayakers and walkers. Want to be involved with a new feature film? 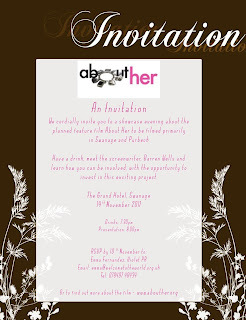 Limited places available: reply by Weds 9th. The dark nights are here, and suddenly broken streetlights and uneven pavements change from a minor irritation into a potential danger. This year, the Fix Before the Freeze campaign encourages you to make a note of street hazards and report them at FixMyStreet.com - now, before they become a winter nightmare. So, on your way home tonight, look out for streetlights that don't work, or pavements that are just waiting to trip someone up, and be sure to report them. If you'd like to help spread the word about the Fix Before the Freeze campaign, there is more information there. Thank you - and watch your step, now! 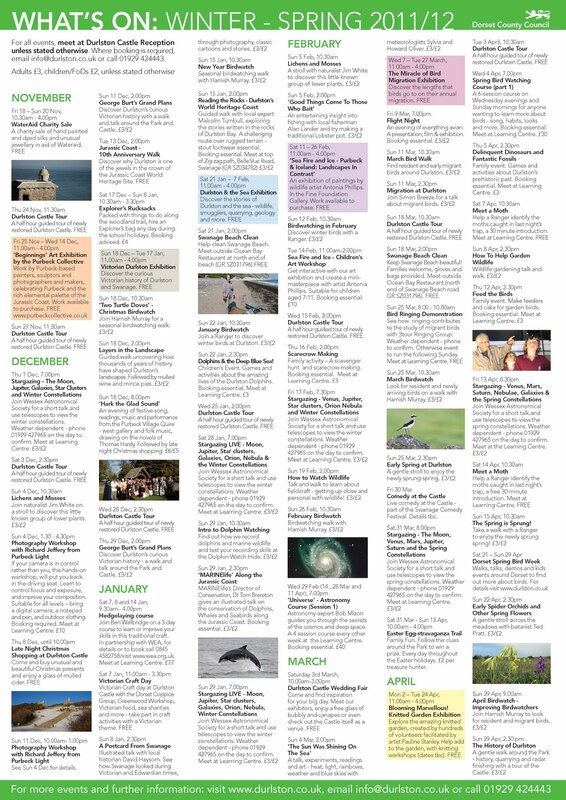 We have more Artsreach events due in the New Year. 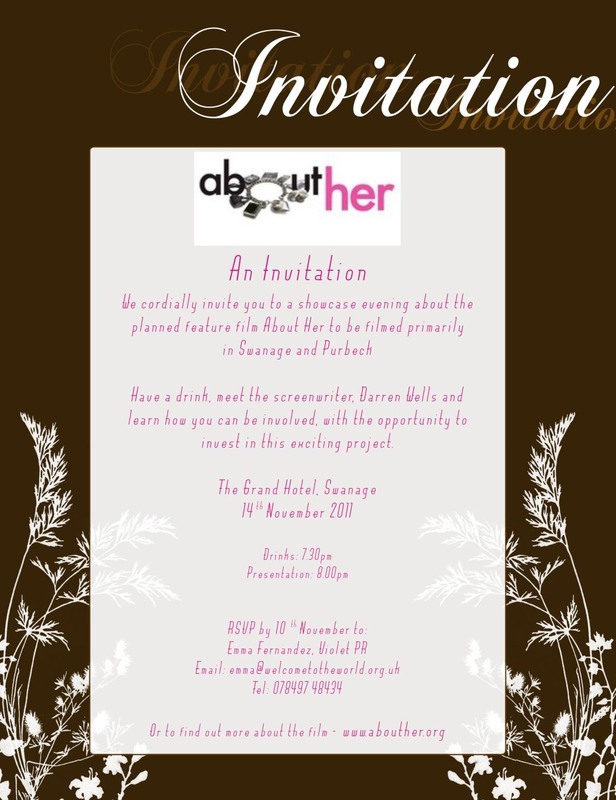 Details will be sent nearer the time. Can anyone remember when the Ferry Company put up parking meters along the Ferry Road in Studland, and DCC had a turn and made them take them down? Well now DCC propose pay and display parking for themselves along Durlston Road and Lighthouse Road! 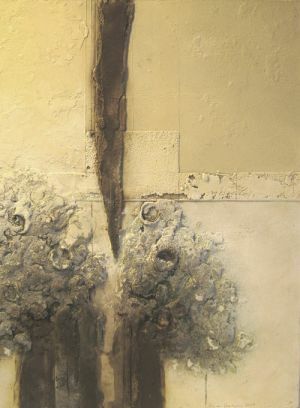 Exhibition on 21 November 2011, 3.30 – 7.30 pm, The Mowlem, Shore Road, Swanage. Information also available at Library and Town Hall. A Council report has been made public today regarding gypsy and traveller sites, ahead of a Council meeting on 8th November. Consultants have been working on behalf of Dorset councils to prepare the Gypsy and Traveller development plan document. A consultation is planned for Nov-Feb across Dorset. After trawling through around 100 sites, the consultants have shortlisted four sites for consultation purposes. One is in Wool and three are in Swanage. Two of the sites at ‘Herston Fields’ and Washpond Lane have been promoted by the landowner for this purpose. The remaining site is within county council ownership in North Swanage. PDC say they are disappointed that at this stage they only have four sites for consultation, which is insufficient to meet the known gypsy and traveller needs in Purbeck. They hope the consultation will help attract landowners to suggest further sites for consideration. Please note that Council on 8th November is only being asked to agree to publishing these four sites for consultation purposes. Council is not being asked to agree to the principle of whether these sites are suitable and should be allocated. Decisions on the sites that will be allocated as gypsy and traveller sites will come later in the plan process. By then they hope other sites will be suggested for consideration providing them with greater choice.